Sky High Slot guarantees high returns not only in virtual cash but also in real money – giving the feel of a real casino from the comforts of your home. A two-tiered 6-reel 20 payline slot, Sky High slots are indeed for those aiming high in terms of earning a handsome bounty. Simbat has done a great job in terms of creating a game with brilliant gameplay and crisp graphics that augments the experience of playing the game. However, will the Sky High Slots live up to the expectations it has built amongst the casino aficionados? Let’s see!! 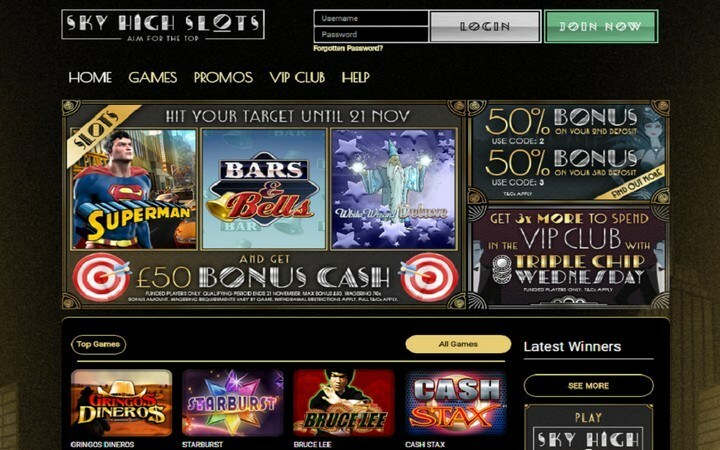 Sky High Slots is one of a kind of online slot game. It is a 6-reel slot – 3 for the bottom game and 3 for the riskier top game. The player can choose to play the bottom game for one credit with a single payline active. Or increase their chances of winning by manually freezing a favorable wheel or by clicking on the Auto Hold button. The Reset button brings backs the frozen reels into action. The top game is a risky affair. This is played for higher stakes with 10-20 credits per spin. Since the stake involved in quite high, the game offers a much generous payout with more active pay lines on board thereby generating multiple winning combinations – not only along lines but also in a crisscross manner. The Balloon symbol is the wild symbol in the games irrespective of the tier that you might be playing. As it appears on the reel, the star symbol lights up on the screen and activates the wild symbol. As the wild symbol is activated, all the other symbols are replaced by the wild symbol and the machine starts rolling and generating winning combinations across the reel. This remains active until the player decides to collect his payout or chooses to spin the sandbag, which puts a stop to the bonus feature. Simbat with a proven track record of churning out great online slots has once again come up with a brilliant game that has lived up to the expectations of the audiences worldwide. Sky High Slots with a high RTP of more than 98% is making waves in the online casino market owing to its unique design language (2 tired- 6 reeled architecture). It has opened up a plethora of thought processes as to how online slots can be designed and has been a pioneer in introducing a multi-layered architecture in online slot design.